The retro-Diels Alder reaction is entropically favoured, because two molecules are made from one molecule. As a result, energy becomes partitioned into additional states because the degrees of freedom are increasing. Internal entropy increases during this reaction. Mathematically, the entropy term is negative in the expression for free energy, so as entropy increases the free energy becomes lower. Because that term is actually a product of entropy and temperature, an increase in temperature has the effect of amplifying the influence of entropy on the free energy of the reaction. Hence, this reaction is favoured by internal entropy factors, which come to dominate at elevated temperature. The maleic anhydride is polarized, with electron density drawn toward the anhydride functional group on one side of the ring. As a result, the other side of the ring is left more positive, and will attract the polarizable electron density from the diene. Lewis acids frequently activate carbonyl compounds towards interaction with nucleophiles. They do so by binding to the lone pairs on the carbonyl oxygen, drawing electron density away from the oxygen and, inductively, away from the neighbouring portion of the molecule. The drawings indicate the two electron-donating groups are operating at cross purposes. 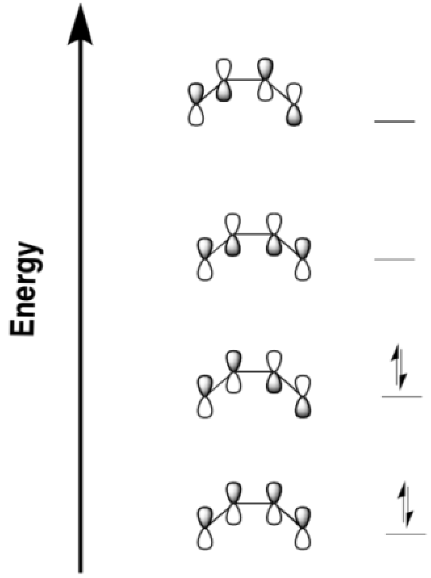 One directs electron density toward one end of the diene, whereas the other directs the electron desnity toward the other end.